Leafbirds are fairly common in the wild, inhabiting India and south-east Asia, including Sumatra, Java, Borneo and the Philippines. All eight species are varying shades of green with medium-sized wings and tails. Throughout their range, these beautiful songbirds often frequent orchards and gardens, searching for an easy source of soft fruits and nectar-filled blooms. Leafbirds also spend a lot of time searching branches and acrobatically peering under leaves for insects and larvae. Even though they are common in the wild, leafbirds are rare in captivity (in the USA), and are almost never bred successfully. The Breeding and HandrearingBlue-winged LeafbirdChloropsis cochinchinensiss at the Riverbanks Zoo are housed in one of several large, mixed-species aviaries within the new Bird House. The leafbirds' aviary is 25ft long x 15ft wide x 30ft high (approx. 7.6m long x 4.5m wide x 9m high). All of the exhibits are covered by a glass roof allowing them to be brightly lit with natural light. In addition, the exhibits are equipped with metal halide and fluorescent lights to supplement the natural light on cloudy days. Some of these are also used after dark as night lights. The exhibit is thickly planted with species, such as the Golden Rain Tree Koelreuteria paniculata, West Indian Cedar Cedrela odorata and a variety of Ficus spp. commonly found in Asian rainforests. Many of the trees are at least 20ft (6m) tall and provide excellent nest sites for small passerines such as leafbirds. The exhibit floor is covered with natural mulch (hat is both aesthetically pleasing and ideal for the terrestrial birds such as the Hooded Pittas Pitta sordida and Indian Pygmy GooseIndian Pygmy Geese Nettapus coromandelianus. The exhibit features a shallow pool surrounded by leafy plants and overhanging branches which the leatbirds regularly use when bathing. The aviary offers plenty of privacy, as only the bottom 7ft (2.1m) of the front is exposed to the public. Viewing is through a fine, stainless steel mesh (ZooMeshTM) which is almost invisible when painted black. Other inhabitants of the exhibit include Fairy Bluebirds Irena puella, Lesser Green Broadbills Calyptomena viridis, Pin-tailed Nonpareil Parrot Finches Erythrura prasina, Dhyal Thrushes or Magpie Robins Copsychus saularis and a Luzon Bleeding Heart Dove Gallicolumba luzonica. All of these species coexist very well. In fact, the Fairy Bluebirds, Hooded Piuas and Blue-winged Leatbirds breed simultaneously without any problems. The leafbirds, however, are very protective of their nesting area and will aggressively chase away other birds. By volume, the diet consists of 55% chopped fruit, 25% Tropical Bits and 20% Red Apple Jungle pellets that are softened briefly in water. All three ingredients are mixed together and offered in the same dish. A proprietary nectar - Nekton LoryTM - is offered in a separate dish. Waxworms (waxmoth larvae), small mealworms, and un (25mm) crickets are also provided. To make the insects more nutritious, the crickets and mealworms are fed romaine lettuce, carrots, sweet potato and Layena poultry meal for several days before use. The high calcium content of the poultry meal helps to correct the inverted calcium-to-phosphorous ratio. If left uncorrected, the high level of phosphorous could lead to a calcium deficiency, especially in chicks which live almost entirely on insects for the first few days of life. In addition, all insects are lightly dusted before use with laboratory grade calcium. Orange slices are skewered onto perches for the birds to eat during the day. Normally, these hold little interest for the leafbirds but are eaten consistently during the breeding season. Indeed, the increased consumption of orange seems to precede breeding activity and is followed by courtship behaviour. We have also noticed this phenomenon in our Crested Oropendolas Psarocolius decumanus and Troupial s Icterus icterus. Perhaps these birds are unable to manufacture vitamin C and not only need regular amounts of dietary vitamin C, but need it in increased levels in order to achieve breeding condition. Aviculturists traditionally shy away from feeding orange due to its acidic content and its implicated role in promoting iron storage disease. While feeding an excess of any natural food is risky (since no natural food is a complete diet) it is reasonable to feed a small amount of most fruits to all fruit-eating birds. Occasionally, an interesting observation will result such as this apparent correlation between the increased consumption of orange and increased breeding activity. 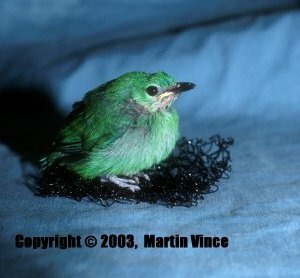 The Blue-winged Leafbirds built small cup-shaped nests. While the outer dimensions varied depending on the chosen nest site and materials used, the inner dimensions were fairly constant, being 5.5cm (approx. 2 1/4in) across and 3.5cm (not quite 1 1/2in) deep. The female chose the nest sites and did most of the building. Materials included burlap strings, sisal rope fibres and palm fibres. We cut the sisal rope into 12in (approx 30cm) lengths and separated it into loose fibres. This was the female's favourite material and was used to line the nests. To encourage nesting behaviour these materials were placcd in an old cup nest. The female quickly 'stole' the materials from this site. If the materials were simply scattered around the aviary perches, she ignored them. The pair nested in thick foliage 10-14ft (approx 3m-4m) above the ground. They almost always built in the West Indian Cedar in the centre of the exhibit, where the top of the tree was in the direct airflow from a vent. This caused the leaves to move in the breeze. As this tree had no real branches, only long branch-like leaves, it was too weak to support even a tiny nest. The female tried several times to build a nest, but each time the leaves collapsed. When a small, wicker canary nest cup was added at her chosen site, she immediately built her nest inside it. The male was very excited during the building process. He called constantly and frequently would sit in the nest while she was away. When he did this, however, the female became very agitated and quickly returned to the nest, whereupon the male left. The female worked diligently on the nest but would stop to solicit copulations. She did this by landing near the male, singing and shaking vigorously. They copulated multiple times during the three days it took her to build the nest. Most of these copulations appeared to be false, as the birds did not properly align their vents. In retrospect, they were probably just part of the courtship. Within two days of finishing the nest, the female laid two eggs and began incubating alone. The male sat nearby and chased off any onlookers that came too close, most often the female Lesser Green Broadbill. The male leatbird brought food for the incubating female, but she always left the nest to accept it. Whenever she left to eat, he would become very agitated. He would fly to the nest, call, and if she did not quickly return, he would sit on the eggs. This always attracted her attention and she would immediately chase him away. The male never tried to damage the eggs or chicks, and eventually was allowed more contact with the young. In a total of six clutches, two eggs were laid in every clutch. The eggs are a glossy cream colour, wreathed with purplish scrawls around the air cell line (at the blunt end). Dimensions are as follows: 24mm long x 15mm at the widest point. Each is laid on consecutive days, with incubation starting after the second egg. The incubation period is about 13.5 days. The chicks are fed mostly waxworms for the first three days. On day four the parents start to include nectar. They accomplish this by drinking nectar, then taking a waxworm, mashing it, and feeding the nectar-worm puree to the chicks. On day five pieces of grape are added, but even then waxworms remain the favourite food. Chicks go from eating a worm per feeding on day one, to six or seven worms per feeding on day eight. For the first four days, the chicks produce tiny faeces which are eaten by the parents. 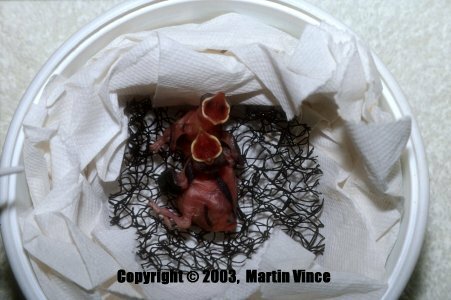 On day five, they start producing faecal sacs which are removed by the parents and dropped in a far corner of the aviary. Unfortunately the nest was located directly in the airflow from a heating/air conditioning vent, and at the top of the exhibit where it is hottest. This environment appeared to cause the chicks to become dehydrated. The female attempted to correct this by wetting her feathers before brooding, but it did not help. Four consecutive clutches were lost between day six and day nine, leading to our decision to remove further clutches on, day five for hand-rearing. After being removed from the nest. the chicks were placed in a Grumbach incubator to provide a constant temperature aid humidity; they weighed approximately 5g. The chicks had no body fat, and were visibly dehydrated with very pale and slightly wrinkled skin. After a few hours in a humid incubator, however, the wrinkles had gone and the skin tone was a strong, dark pink. The chicks were very temperature-sensitive and shivered if the temperature dropped below 100°F (37.8°C). To prevent dehydration the incubator was kept at a constant 80% Relative Humidity. The diet fed was Kaytee Exact Original hand-rearing formula. There were no problems adjusting from the livefood to the formula. The first feed was one part Kaytee Exact mixed with four parts water (1:4). Thereafter the food was mixed to a ratio of 1:3 until day 10. From day 10 until weaning, the food was thickened and mixed at a ratio of 1:2. The chicks were fed with a flexible syringe tip cannula on the end of a 1.0cc tuberculin syringe. A syringe tip cannula is normally used for the treatment of cattle teats, but the 1in (25mm) long, thin flexible tip is also ideal for feeding small passerines. It fits easily onto the syringe and can be disinfected between feedings. All of the hand-feeding implements were disinfected daily with a diluted chlorhexidine solution. Tapping the table next to the chicks elicited a strong feeding response. For the first ten days, the chicks were fed 14 times a day from 8.00am - 10.00pm, with the late feeding being particularly important to prevent dehydration. In addition to syringe feeding, we began to use tweezers on day 10 to feed small pieces of Red Apple Jungle pellets and grapes soaked in the hand-rearing formula. Small amounts of Nekton Lory nectar were gradually added to the diet to allow the chicks' digestive systems to adjust. At day 16 the chicks fledged arid were no longer fed after 5.00pm. They were fully feathered and a shade darker green than their parents. At this point we began feeding them entirely with tweezers, including more fruit and pellets in the diet. Each piece of food was first soaked in the Kaytee/nectar mixture. Once they had fledged, the chicks were occasionally offered nectar or water with a spoon to encourage self-feeding. Being nectar drinkers, the chicks had no problems drinking nectar and water from the spoon, and would sometimes consume as much as one teaspoon of this. Hand-feeding became difficult once the chicks fledged because they were more interested in flying than eating. However, tapping on the perch quickly caught their attention and encouraged a feeding response. Food and water dishes were added to the brooder on day 21 to encourage self-feeding, and on day 30 the chicks were moved to a small indoor aviary. The hand-feedings were reduced gradually, and by day 36 the birds were reliably feeding themselves. 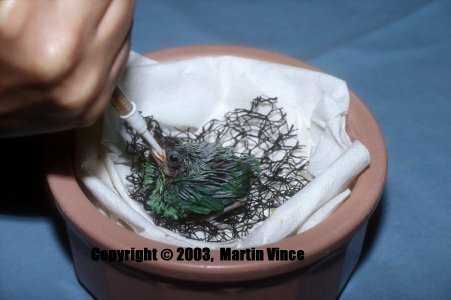 The chicks mouhed into their light green adult plumage within two months of weaning, and were then indistinguishable from the adults. For Riverbanks Zoo and Garden's complete hand-rearing notes, please e-mail: ahardy@riverbanks.org. 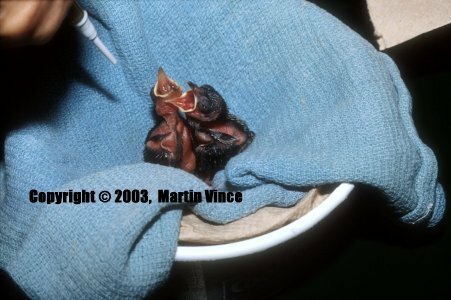 In 2002 we successfully raised three Blue-winged Leatbirds. All were DNA sexed as females. One bird has gone to the North Carolina Zoo to enter its breeding programme. The other two females will remain at Riverbanks to be paired with unrelated males and perpetuate our leafbird breeding programme. We believe that this is a world first breeding. Any member knowing otherwise are asked to contact the author or the Hon. Editor of the Avicultural Magazine. Red Apple Jungle pellets: extruded, cylindrically-shaped pellets nearly lin (25mm) long and 5/16in (9mm) in diameter and bright red in colour. Manufactured by Marion Zoological, Wayzata, Minnesota, USA. Tropical Bits: with the same nutritional content as the above, but only the size of finch seed and normally marketed for finches and canaries. Manufactured by Marion Zoological, Wayzata, Minnesota, USA. Several manufacturers, such as Pretty Bird and Kaytee, produce equivalent products. PO. Box 1060, Columbia, South Carolina 29202-1060, USA.